On our second full day in Braxieux we went walking, following one of several marked walks through the woods. It was boggy underfoot from the moment we lost the trail. When you have Google Maps in your pocket you don't worry so much about marked trails and so we just walked until we were ready to change course and begin heading back. The afternoon was due to be sunny and so we returned to town in time for the shops to have closed so we couldn't buy any beer to drink. Actually the second of the two little supermarkets was open. We bought beer, and ham to make a sandwich. The shop keepers were a couple well past retirement age and there was no till to speak of, just two calculators with paper rolls. For dinner we considered buying pizza from the campsite but conceded that we should use some of the ingredients we already had and save some money. We made macaroni cheese, adding a considerable amount of garlic to make it more French. Strangely, on our four-and-a-half hour drive north through France the weather has become warmer. Not always sunnier, but warmer none the least. So it was even more satisfying asking at Camping Indigo Les Chateaux if we might stay four nights instead of the one booked and paid for. We'd planned the single night here as a half way point between Sarlat and the Eurotunnel and had determined that we'd scope it out for a longer stay in our summer fortnight. Checking in at 2pm, we'd not have been able to fully explore the region. The campsite is in the small town of Braxieux. In itself the town isn't a destination, boasting two small supermarkets and the usual butcher, baker and hairdresser, plus a bar, cafe and hotels. However, this is a fantastic base to explore the Loire castles. It's slap bang in between the chateaux of Chambord and Cheverny, 8km and 9km on flat cycle paths and woodlands walks that crisscross this part of the countryside. 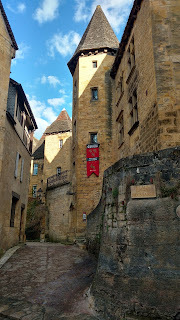 A colleague at work told me Sarlat was supposed to be beautiful. This was all I knew before we arrived as, like our prior destination, I hadn't done any research. And, yes, it turns out that is true. We arrived, after nearly six hours of traveling from Divonne Les Bains, at 1.45pm. Reception at Camping Indigo Sarlat was open and they let us check in ahead of official arrival time. We'd booked a 'plus' pitch which are larger and come with a picnic table, and we were armed with a map and the choice of two pitches. I think the campsite map is a little bit pants as we went merrily driving up a hill that looked like it was the right direction, but clearly wasn't. The girl from reception was in hot pursuit in her golf buggy, asking us to follow her back down and to the correct pitch. I know the map is at fault because over the course of the next four days we watched countless other people do the same. It was quite amusing.